With regard to the case of technical infrastructures serving the public and heavily equipped with display devices, the issue of 'normal accidents' (Charles Perrow) has to be raised anew. Responding to service interruptions, cooperation has to meet requirements which cannot be dealt with exclusively either in terms of face-to-interface interaction or within the jurisdiction of organizations or as matter of the civil structure of urban public spaces. Provided this condition of heterogeneous sets of norms, the sub-project, drawing on practice theory, offers a pioneering study on how they come to interrelate. Gießmann, S., Röhl, T., & Trischler, R. (Eds.). (2019). 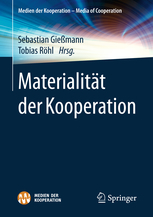 Materialität der Kooperation. Wiesbaden: Springer VS.